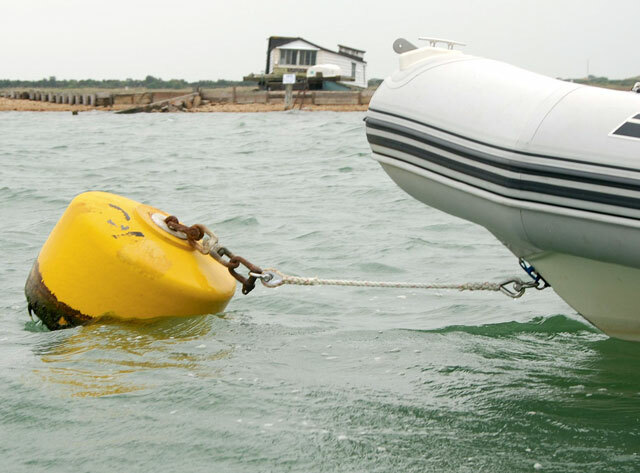 The mooring strop on a RIB is normally secured by one shackle on the buoy and the other on the bow ring of the RIB. The shackle is often wired or has a tie through the shackle pin to prevent it from being twisted undone, but these methods can be difficult to fit – especially at the RIB end – and are not always very secure. A far more secure method is to fit a 14mm bow shackle and make it secure with a 5mm D-shackle – in effect seizing a shackle with another shackle. This arrangement can be used at both ends of the bridle – I find it easiest to remove the bridle from the buoy and tie it back on board the RIB when I’m out for the day. Any turning moment on the bow shackle is prevented by the long shackle. There are no turning forces on the long shackle. Readers will probably find other applications where this could come in useful.